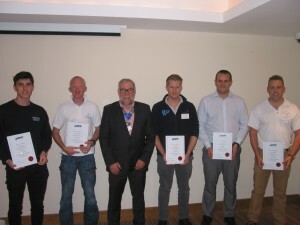 Back in October the Institute of Swimming Pool Engineers presented its 113th One-Day Seminar at the Watermill Hotel near Hemel Hempstead, Hertfordshire. Just over 40 delegates attended the event which included presentations from Ian Betts FISPE, Allen Wilson FISPE, and ISPE President John Cheek FISPE. Chris Carr also gave an update on the proposed ISPE Continuous Professional Development (CPD) scheme and it is hoped that the ISPE will pre-launch the new CPD scheme, at SPATEX 2017. Chris said that the most important thing was for ISPE members and others to be able to take advantage of training opportunities and he praised the industry-supported free training days which are currently being presented by Certikin International and CPC. Following the short AGM during which ISPE Council members Ben Studdy, FISPE, and Malcolm Sharp, FISPE, were re-elected to serve on the Council of Management, John Cheek presented the 2016 ISPE Awards. Around 50 students sat the Institute’s Level 1 Examinations in March 2016 and John presented certificates to the newly qualified technicians. The Gartside Cup for the Student of the Year was presented to Troy Godfrey of IJ Cannings who achieved the highest overall marks in the exams. The Peter Littlehales Cup, which is presented from time to time for an excellent seminar presentation, was this year awarded to Allen Wilson in acknowledgement of all the presentations he has given at the ISPE seminars over the last few years – even while on crutches after an injury. Looking ahead to 2017, members can register their interest for the forthcoming ‘Back to Basics’ and ‘How to Pass the ISPE Exams’ seminar to be held in February 2017 in Hertfordshire. The event will include presentations on the four subjects of the course and will look at revision tips, where marks may be won and lost, and will offer general guidance to assist those about to sit the ISPE exams in March 2017. The seminar is free to ISPE students and just £25 to all other ISPE members. Non-members are also welcome at £30. Places are limited so please email ross@ispe.co.uk to register your interest.